Avail from us a wide spectrum of Power Electronics that are high in quality. We offer these at competitive rates. 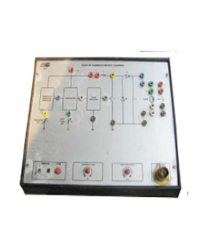 We are counted as a reliable manufacturer of the optimum quality of Characteristics of IGBT Trainer. 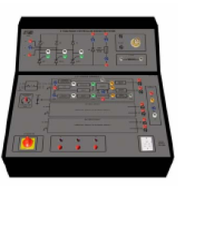 Demonstrates the v-i characteristics of an IGBT, the offered trainer is designed in harmony with the industry laid norms and regulations. Besides this, the optimum quality of the offered IGBT trainer is never compromised at our end. Demonstrates the v-i characteristics of an igbt. Mains on / off switch with led indicator for supply “on”. Working on 230v, 50hz 1f ac mains. 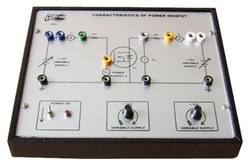 Characteristics of Power MOSFET is a versatile and well - designed self - contained trainer kit. 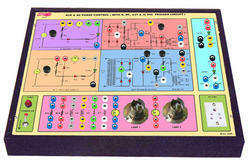 It is a useful training tool for the teacher and the students for basic electronics. → V-I Characteristics of a Power Metal Oxide Semiconductor Field Effect Transistor ( MOSFET ). → Switching Characteristics of a Power MOSFET. Built - in MOSFET and other necessary components. → 0 - 15 V / 100 mA Variable power supply. → 0 - 12 V / 100 mA Variable power supply. 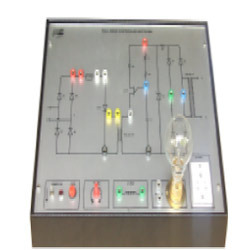 Multi - coloured sturdy 4mm test points are provided at various stages in the circuit to observe the waveforms, voltages and for necessary inter connections. Provision for connecting external voltmeter / current meter as per requirement. Housed in an elegant ergonomically designed powder coated metal cabinet with a well spread intelligently designed circuit layout on the front panel. Working on 230V, 50Hz, 1f AC mains. → Quantity : 01 numbers provided. → Quantity : 01 number provided. Leveraging by the in-depth knowledge of this domain, we have been able to offer our patrons with the best quality of Bridge Inverter Using IGBT Training Kit. To study or demonstrate the working of transistorized bridge inverter, the offered training kit is used. The offered training kit is available with us at cost effective prices. Input: 230V, 50Hz AC rectified to 300V DC. Output Frequency: Variable from 30 Hz-100Hz. Circuit using 4 IGBT’s and over curcuit & PWM generation circuit. Valued as a reliable manufacturer and supplier, we are engaged in offering the optimum quality of Jones Chopper ( Voltage Commutated Chopper). For manufacturing the offered chopper as per the industry laid norms, the latest machinery and cutting-edge technology is used. Owing to its high performance and low maintenance, the offered chopper is highly demanded. Principle : Conversion of a Fixed DC to Variable DC Voltage. Type of Chopper : Jones Chopper. D.C. Source : 24V DC (Unregulated). Trigger Circuit : 1. UJT Trigger Circuit with variable trigger frequency to trigger the Main SCR. UJT Trigger Circuit with variable trigger frequency to trigger the Auxiliary SCR. Commutation : Class “D” Type. Output Voltage : 5V to 20V approximately (variable). Output Frequency : 30V to 100Hz approximately. Duty Cycle : 20 to 70% at 50Hz approximately. Controls : 1] Mains ON / OFF. Test Points : Multicoloured Test Points are provided at various stages in the circuit to observe the waveforms and voltages. Experiments : 1] Study of SCR Trigger Circuit for a Jones Chopper. Observe the output voltage with Motor Load. Observe the effect of ON Time Control on Output. Owing to our rich experience of this domain, we are engaged in manufacturing the premium quality of Step Up Transistorised Chopper. To demonstrate the principle and working of set up transistorized chopper, the offered experimental equipment is used. Being a quality focused name, we assure that the quality of the offered step up transistorized chopper is never compromised. Type of Chopper : Step Up Chopper. Trigger Circuit : VCO and Comparator based Transistorised Firing Circuit. Output Voltage : Variable Upto 220V DC. Duty Cycle : Variable Upto 75%. Observe the waveforms and voltages. Experiments : 1] Study of Transistorised Step Up Chopper Circuit. Observe the output voltage with Lamp Load. Observe the effect of Duty Cycle Variation on Load. With the aid of latest machinery, we manufacture and supply the best grade of Morgan's Chopper ( Current Commutated Chopper). The principle and working of morgan’ s chopper is demonstrated and studied by using the offered products. With the aid of our large production capacity, we have been able to deliver the offer chopper at the patrons’ end. Principle: Conversion of a Fixed DC to Variable DC Voltage. Type of Chopper: Morgan’s Chopper. D. C. Source: 24V DC (Unregulated). Trigger Circuit: UJT Trigger Circuit with variable trigger frequency to trigger the SCR. Output Voltage: 5V to 20V approximately (variable). Controls: 1. Mains ON / OFF. Indicator: Mains ON / OFF. Experiments: 1. Study of SCR Trigger Circuit for a Morgan’s Chopper. Observe the effect of Load Control on Output. Being a leader of this domain, we have been able to manufacture and supply the optimum quality of Step Up Transistorised Chopper ( Make Adtron / Model 85). Its electrical stability and durable construction, make this step up transistorized chopper highly demanded. Our patrons can avail the offered step up transistorized chopper in various specifications. Since the inception of our company, we manufacture and supply the best quality of 3 Phase Half Controlled Bridge Rectifier. 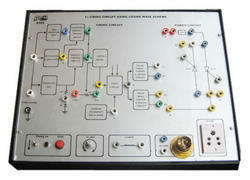 By using SCR, the offered rectifier is used to study various bridge controller. Being a quality focused name, we assure that the quality of the offered bridge rectifiers is never compromised at our end. 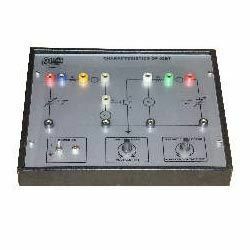 Demonstrates the principle and working of 3 φ Half Wave Controlled Rectifier using SCR. Trigger circuit separate for each phase. Trigger circuit using Ramp Comparator Scheme. Step down 3 φ AC supply 110V star connected is provided so that phase control can be observed on lamp. Resistive ( lamp ) and RL load is provided. Firing angle can be controlled from about 300 to 1700. Firing angle potentiometer is provided. 3 φ Bridge consisting of 3 SCR’s and 3 diodes. Supply required 3 φ 440V, 50Hz AC. Test points at various stages in the circuit, to observe the voltages and waveforms. Set of patch cords provided. Strongly supported by a comprehensive manual complete with theory and operating details. To study the nature and generation of Control Signal for 3 φ Halfwave Controlled Rectifier. To study the operation of a 3 φ Halfwave Controlled Bridge Rectifier with R Load. To study the operation of a 3 φ Halfwave Controlled Bridge Rectifier with R - L Load. To study the effect of Free Wheeling Diode on the output waveform. Owing to our rich experience and vast knowledge of this domain, we offer the optimum quality of 3 PhaseFull Controlled Bridge Rectifier. 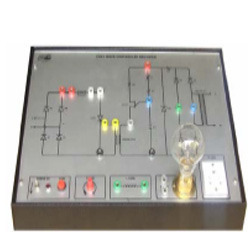 By using advanced SCR, the offered equipment is used to study the working of various bridge rectifiers. The optimum quality of the offered rectifier is never compromised at our end. Demonstrates the principle and working of 3 φ Half Wave Controlled Bridge Rectifier using SCR. 3 φ Bridge consisting of 6 SCR’s. To study the nature and generation of Control Signal for 3 φ Fullwave Controlled Rectifier. To study the operation of a 3 φ Fullwave Controlled Bridge Rectifier with R Load. To study the operation of a 3 φ Fullwave Controlled Bridge Rectifier with R - L Load. Demonstrates the principle and working of AC Phase Control using SCR by Four different methods of SCR triggering. → Resistance ( R ) Trigger Circuit. → UJT Trigger Circuit ( Resistance Controlled Ramp ). Effect of Phase Control can be observed on load. Set of required number of Patch Cords provided. ü Completely self - contained stand - alone unit. ü Demonstrates the principle and working of AC Phase Control using Triac by three different methods of Triac triggering. ü Supply required 230V, 50 Hz AC. F Resistance ( R ) Trigger Circuit. F UJT and Pulse Transformer, Trigger Circuit. ü Effect of phase control can be observed on load ( lamp ). ü Test points at various stages in the circuit, to observe the voltages and waveforms. ü Set of required number of Patch Cords provided. ü Housed in an elegant cabinet with a well spread intelligently designed circuit layout on the front panel. Triggering circuit using ZCD, Integrator, Level Shifter, Comparator, Logic Circuits and Pulse amplifier. Comparison with a reference pot. Effect of phase control on Lamp. ü Triggering circuit using ZCD, Ramp Generator, Comparator, Logic Circuits and Pulse amplifier. ü Comparison with a reference pot. ü Effect of phase control on Lamp. ü Strongly supported by a comprehensive manual complete with theory and operating details. Triggering circuit using ZCD, Ramp Generator, Comparator, Logic Circuits and Pulse amplifier. 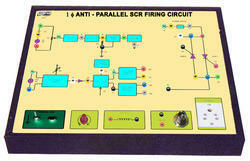 Demonstrates the principle and working of 1f Half Wave Half Controlled Rectifier using SCR. Triggering circuit using UJT and Pulse transformer. Effect of phase control can be observed on R ( Lamp ) and R - L load. P Completely self - contained stand - alone unit. P Demonstrates the principle and working of Transostorised PWM Converter. P Triggering circuit synchronized to the mains and with frequency and duty cycle controller. P Power circuit using Power Transistor. P Effect of phase control on Lamp ( R load ) Inductive ( R-L load ). 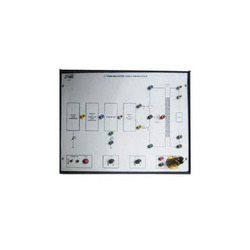 P Multi - coloured sturdy 4mm test points are provided at various stages in the circuit to observe the waveforms, voltages and for necessary inter connections. P Set of required patch cords. P Housed in an elegant cabinet with a well spread intelligently designed circuit layout on the front panel. P Strongly supported by a comprehensive manual complete with theory and operating details. Keeping the update of latest happening in this domain, we offer the optimum quality of 3 Cyclo Converter Trainer. 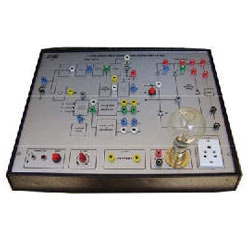 Designed as per the industry laid norms, the offered 3 cyclo converter trainer is used to convert AC input voltage into variable AC output voltage with the change in output frequency. 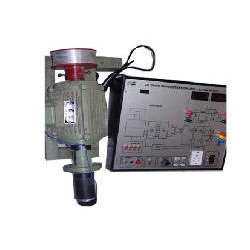 The offered 3 cyclo converter trainer is designed by using latest machinery. It is an experimental kit for converting ac input voltage into variable ac output voltage with the change in output frequency. Line synchronized firing angle circuit. Output frequency can be 1/3rd or ½ of the input frequency. Availability of test points at strategic locations for observations of respective waveforms on cro. Variable frequency / variable output voltage. Over current / dv / dt protection. 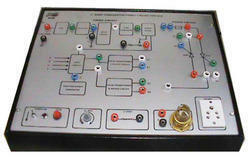 We manufacture and supply the best quality of Full Wave Half Controlled Bridge Rectifier Trainer. Its electrical stability and compact design, makes this trainer highly demanded. 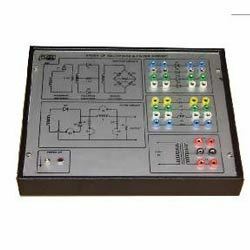 Our patrons can avail the offered full wave half controlled bridge rectifier trainer in bulk quantities, as per their needs and demands. Two-isolated gate signals for Full Bridge Converter. Firing angle variable from 1800 to 00. Gated carrier source at 4 KHz. Soft start circuit is built-in. Housed in a sleek cabinet. 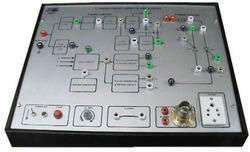 Test points are provided on the front panel for detailed study of circuit signals by the student. Signals using CRO, DVM, etc. One Potentiometer to vary the firing angle. All the test points of the control circuitry for correct functioning. Input: 230V 10%, 50Hz single phase AC. 15V DC @ 0.5A regulated output for the control circuitry. Two nos of SCR’s rated for 1200 volts-VAK & 25 Amps IA. Two diode for free wheeling. Each device is provided with. RC Snubber for dv / dt protection. All the G, A, K & MT terminals are terminated on connectors to use patch cords. One fixed Resistive load ( Lamp Load ). All points are terminated at the front panel for wiring for each experiment. Adtron’s speed control of dc motor using chopper unit is a versatile stand alone unit useful in the study & demonstration of the principle & working of a speed control of dc motor using chopper. The circuit consists of a square wave generator, square to triangular wave generator, comparator, isolation circuit, driver circuit & power transistor circuit. A motor load (l load) & lamp (r load) load is also provided. 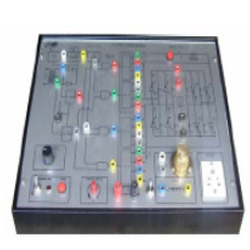 It is housed in an elegant metal cabinet with a well spread intelligently designed circuit layout on front panel. 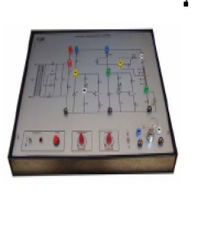 Multi-coloured test points are provided at various stages in the circuit to observe voltages & waveforms. Input: 230v, 50hz ac 1φ. Output: variable dc (0-12v) chopped output. Circuitry: square wave generator, square to triangle wave generator, comparator, isolation & driver circuit. Power Circuit: using power transistor. ADTRON’S AC Drive Demonstration Unit is a versatile stand alone unit useful in the study & demonstration of the principle & working of an AC drive. The circuit works on the principle of PWM with frequency & voltage control. A 1 φ 1HP AC motor coupled with a Speed Measurement & loading arrangement is also provided. A 3 pin mains socket for connecting the CRO is also provided for isolation. 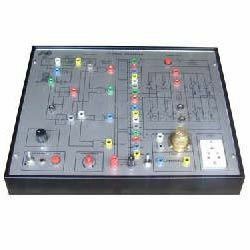 It is housed in an elegant metal cabinet with a well spread intelligently designed circuit layout on front panel. 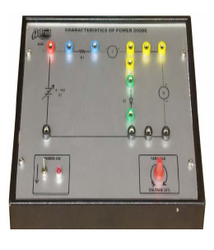 Multi - coloured test points one provided at various stages in the circuit to observe voltages & waveforms. Output Frequency: Approx. 10Hz to 50 Hz. Circuitry: PWM based circuitry frequency control. Power Circuit: Using either MOSFET/IGBT. Load: 1HP1φ AC motor with Speed Measurement coupled to it & loading arrangement. 8 pin socket for connecting motor & tacho. 3 pin socket for CRO. 3 ½ digit to indicate AC voltage. 3 ½ digit to indicate speed in RPM. 1 HP AC motor 3φ 230V, 50Hz with Speed Measurement & loading arrangement. 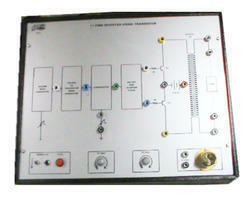 Study the PWM firing circuit of an AC drive. Speed control of AC motor. 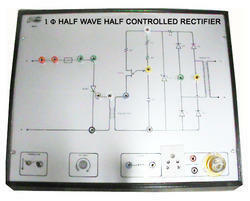 We are instrumental in offering the premium quality of 1 Full Wave Full Controlled Rectifier. Owing to its high functionality, overload protection and compact design, the offered rectifier is highly demanded. Backed and supported by wide distribution network, we deliver the offered rectifier within the assured time frame. Demonstrates the principle and working of 1φ Full Wave Controlled Rectifier using SCR. Effect of phase control can be observed on R ( Lamp ) and R - L ( Motor ) load. 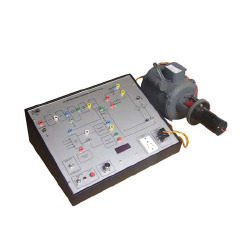 Keeping the track of latest happening of this domain, we have been able to manufacture and supply the best quality of AC Motor Speed Control Demonstration Unit with 0.5 Hp 1 Ind. 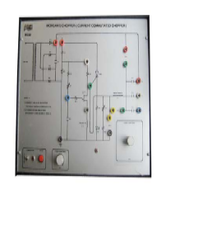 The offered demonstration unit is used for demonstration of working of thyristor controller of air conditioner motor. 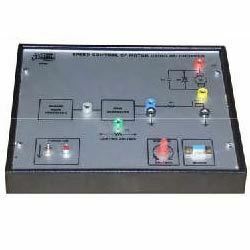 Rendered by us at cost effective prices, the offered AC motor speed control demonstration unit is highly demanded. Input : 230V, 50Hz A. C. 1φ. generator, Camparator and Pulse generator. Power Circuit : Using SCR’s of 600 V/ 4 A rating. 0.5 HP / 1φ, AC Motor. Controls : Potentiometer for firing angle Control. Experiments : 1. To study the nature and generation of Thyristor Control Signal. 1φ Full wave AC phase control with Resistive (lamp) load. 1φ Full wave AC controller for 05 HP Induction Motor. By using latest machinery and cutting-edge technology, we manufacture and supply the optimum quality of 1cyclo Converter ( Make Adtron / Model 8518 ). For the purpose of converting AC input voltage into variable AC output voltage, the offered experimental kit is used. Owing to its user-friendly operations, the offered 1 cyclo converter is highly demanded. Since the inception of our company, we have been able to manufacture and supply the best quality of Full Wave Mid - Point Converter With R Load. By using the offered product, the teachers and students can study the principle of full wave mid in the most efficent manner. The premium quality of the offered full wave mid is never compromised and it is maintained as per international quality set norms at our end. Demonstrates the principle and working of Full Wave Mid - Point Converter with ‘R’ Load. Effect of phase control can be observed the firing circuit of Full wave mid point converter with ‘R’ load. With the aid of latest machinery and skilled workforce, we have been able to offer the finest quality of Rectifiers and Filters Trainer Kit. 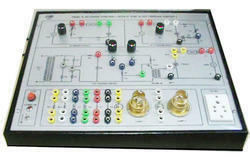 To study the working of various rectifier circuits, the offered trainer kits are used. By using quality assured materials, the offered rectifier and filters trainer kit is precisely fabricated as per the industry laid norms. Demonstrates the principle and working of different rectifier circuits such as half wave, full wave, and bridge and effect of different filter circuits on its output. Built-in step down centre tapped transformer. Built-in bank of rectifying diodes, capacitors, resistors and coils. Demonstrates the different characteristics of various rectifying circuits with and without filters. Determination of ripple factor for all filters circuits. Different filter circuits like capacitors filter, inductance filter, l section filter and pi filter. Looking for Power Electronics ?